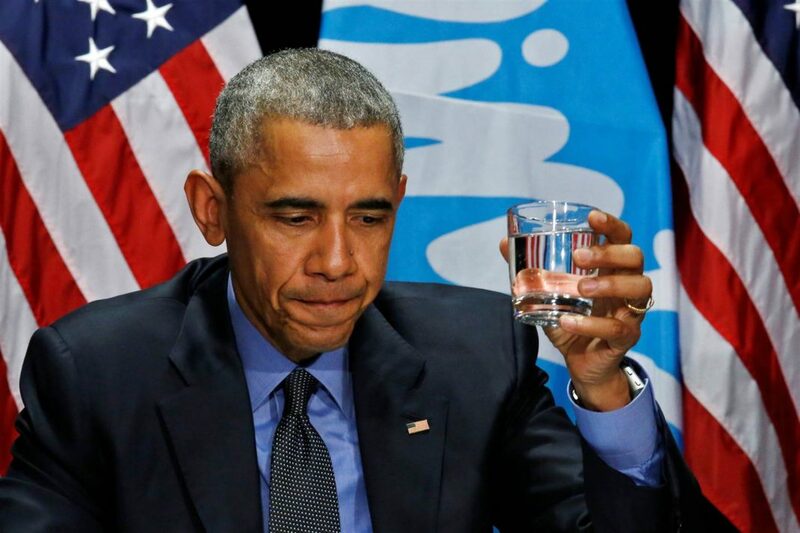 Obama sips filtered Flint water but takes no action to resolve the lead poisoning issue. DETROIT, Michigan, U.S.A. — After two years of Black American citizens’ ingestion of poisoned lead waters, U.S. president Barack Obama finally visited Flint, Michigan. For publicity, he took a sip of the lead water (filtered, of course) and so brief you wondered if he even tasted it or just pretended to — a far cry from the daily bathing and drinking rituals community residents have endured with water that isn’t even safe for household cleaning. In Flint, a predominantly African American community, government officials deliberately switched the water from a clean source to a poisoned source, the Flint River. Obama admitted that the crisis “was a man-made disaster; this was avoidable, this was preventable,” but no one has been charged nor jailed for this crime against humanity. Perhaps because the U.S. government rarely holds white Americans accountable for crimes committed against Black Americans. All this is happening under Obama’s watch. Remember him? The fellow who accepted a Nobel Peace Prize before accomplishing anything during his presidential reign. On paper, Obama and the U.S. government’s Environment Protection Agency (EPA) advocate for a mission of access to safe and clean water as a human right. On any given day, clean water could be a topic in a course on civics and the environment or the answer to a question about the EPA on the quiz show Jeopardy. But this phrase “clean water as a human right” in some thousand-page document is not enforced with any hint of conviction when it comes to Black communities. Besides the Flint disaster, the Detroit Water and Sewerage Department plans to shut of water access to 150,000 Detroit residents for failing to pay recent water bills. Despite nearly forty percent of Detroit residents now living in poverty, the price of water in Detroit continues to rise–the current household average is sixty-five U.S. dollars per month (compared to the national average of forty dollars) and is slated for a nine percent increase. The water hasn’t changed. It still comes from earth-given natural bodies of water. But the price keeps going up! Meanwhile thousands of corporations across the U.S. go weeks, months, and even years without paying water, gas, or electric bills. In fact, the top forty commercial and industrial businesses (including a number of apartment complexes and real estate agencies, a laudromat, a cemetery, and the auto-making Chrysler Group) have past-due water bill accounts that total 9.5 million U.S. dollars. Yet their water access will not be shut off. Clearly there is a double standard when it comes to rights. In the U.S. African Americans, are deprived of basic rights and freedoms, while corporations have no limit to their liberties, all the better when the private companies trounce upon the livelihoods of individual Black citizens. No doubt, the attacks on Detroit and Flint, Michigan are part of a larger scheme to cleanse the metropolitan area’s population of African Americans to make way for the whims of white professionals whose thirst for more and better things (now land) never subsides. The same ethnic cleansing projects have been carried out all over the U.S. in major metropolitan areas. For instance, New York City’s Brooklyn and Harlem have seen their African American populations dwindle with targeted War on Drugs/Blacks policies that basically round up unsuspecting African American men and women in police vans, charge them with all sorts of fictitious crimes, tell them they could face thirty years to life, bully them into taking a plea bargain for a lesser sentence (or shackle them with long sentences if they fail to cooperate), and steal their property while their health deteriorates behind bars. Only this reign of terror does not just stop in America. Now minds are churning with plots to thwart the growing African middle class, or at the very least redirect its earnings to western companies–anyone hungry for some olive oil and imported tomatoes? Any children needing a private mission school liberal arts education? The fact that the U.S. continues to use its government to oppress African American progress does not surprise most. But what does surprise many is that Barack Obama and his wife Michelle, too, are part of this racial injustice. It shows that a black face in leadership means absolutely nothing. In 2008, who would have thought that Obama would have turned a blind eye to the forced relocation tactic of poisoning water supplies so that African Americans would have no choice but to abandon their owned homes and leave with nothing to start a life elsewhere, just so whites can pillage their property? Who would have thought the Nobel Peace Prize was the befitting symbol for such inhumane tactics? But then again, Obama advocates more for the rights of white women and transgender white men and women than he does for African Americans or any cause or issue that greatly effects African American communities. No matter that his children are Black, they will just become part of the fabric of white privilege. They will not set foot in a public school in Detroit, nor drink any water from Flint, Michigan. Meanwhile, Obama has given billions of dollars to Israel but gives nothing to African Americans in Flint. Not one penny. He only takes photos as if African Americans do not deserve solutions but only wallet-sized memories. Really it is not about money. When what seems like a catastrophe to you and me, a problem that needs fixing, is actually the plan gone right, then we are at our last lengths in fighting for racial justice. Whenever African Americans thrive and form a growing Black middle class as in Detroit and New York City, the U.S. government designs and executes a usually covert forced relocation plan to drive wages down, kill jobs, and break up successful Black neighborhoods. By now the ethnic cleansing and by some measures genocides are actually quite overt, since across the world, no upstanding country or leader dare address these mass atrocities against humanity. Detroit citizens have petitioned the United Nations to respond to the emergency and life threatening situation they are facing with no access to water. But remember that African Americans have gone to the UN before, about mass incarceration, police violence, and racial discrimination, and the UN like Obama only issues verbal reprimands. After all, the U.S. is the major donor to the UN and the organization has no incentive to halt its financial flow. Likewise, the U.S. neighbor to the north, Canada, will not take in Black American refugees. In fact, all the west tolerates the vile treatment of African Americans. It suits their mission of whiteness and world dominance. Who then can African Americans speak to when those who heed their words are the very architects of their destruction? Who will hear the African Americans’ cries for help against a brutal oligarchy that has for more than five hundred years tormented the racial group and made it abundantly clear it will do so for many more centuries? Why do Africans turn blind eyes and deaf ears to their brothers and sisters across the ocean? Whether in the U.S. or in Africa, electing Black leaders without careful thought and discernment will result in a complete failure of leadership. During Barack Obama’s eight-year term, employment status, health conditions, and economic gains actually grew worse for African Americans. Given Obama’s failure, African leaders too should not be automatically expected to do the right thing when it comes to bestowing human rights upon citizens. Let us not make the mistake of thinking a black face or a face from our ethnic group will rightfully represent our community. African Americans’ support of Barack Obama sadly did not help in their gaining human rights in this world. We must demand that our leaders serve our communities or else we should seek other leadership, courageous and true. How else can we ensure that our children have clean and safe drinking water and that our lands remain in our possession? Puppet leaders will not be the downfall of our communities if the people remain vigilant about who to trust and weary of who only presents a friendly face and nothing more. Afiya X has blown the cover on Obama and his ambidexterity owing much to the the fact that he himself is more white than Black, that he himself is more European than African. But if that weren’t the case, he would have understood the equal humanity of all peoples. It’s sad. The Nobel Peace Prize in 2008 went to waste! Obama’s disastrous dalliance over the water crisis in Flint, Michigan, can only baffle those who haven’t seen him sign away the lives of US citizens droned without trial. Obama is spineless, he is a coward, a chicken-head, a dastard and above all, a poltroon! The guy is an empty suit. A shill for corporate entities and Wall Street . His hope and change nothing more than hypocritical slogans. Jolting that the American middle class ceased to be a majority in the era of the hope and change president. When I see clueless schooled Africans fawningly admiring him, I laugh. Our schooled folks have a long way to go before they began educated. I am thoroughly disappointed in Obama that I can’t even comment. But, I pray for my fellow African Americans in Flint, Michigan. I pray fro them. May God repay Obama and his Chicago Mafia crew greatly and in the same coin. May they get cancer and their children more cancer. May they suffer and die, may their dead bodies rot before finding. I am pissed. Really pissed! The American Machine is ruthless. Once, you step up, you are gridlocked into position. You become a robot … Yes, even the President! Hahaha…. This funny. Working on a piece, tentative title is “8 goddamn years of Onbama Later…” I’ve known since 2007 when he bursted onto the scene that he was a fraud. “Water, water, water everywhere, Polytank is always there, Polytank… din dinnnn…” We have it good in Ghana oh! Unfortunately, to poison the people is a central theme of the US government. Let us examine some of the historical significance. After Prohibition in the US, the Federal Government of the United States – the so-called land of the free – started poisoning alcohol, in the name of, “Well, since alcohol is already bad for you, drinking it means you already don’t care about your life and that you want to die.” What intelligence, right? They poisoned anything from akpeteshie to brandy. People who quaffed went blind, suffered from cancer and all kinds of debilitating diseases! This is the US oh! Fast forward to the War on Drugs/Blacks! The same US government was pumping drugs into neighborhoods in order to make money to fund wars in Latin America. Serious oh! Flint is not the first. It won’t be the last. This is the nature of the beast that is the US government. They stop at nothing and care less about sacrificing their own people if it means money in the pockets of the rich and prosperous. Na, Capitalism for you, at its elaborate best.